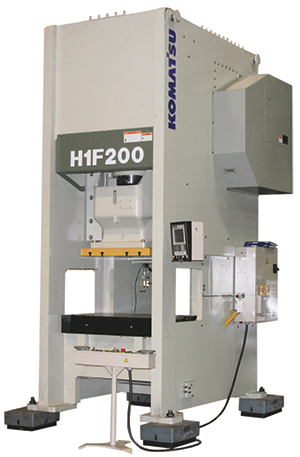 Under power at the Komatsu booth in the METALFORM technology area of Fabtech will be a model H1F 200 servo-drive press—a 220-ton single point press featuring a flexible automation system and new feed system specifically designed for servo-press applications. All Komatsu servo presses feature slide accuracy and repeatability measured in microns; fully programmable slide velocity and dwell for optimum throughput and control of reverse loading; and reportedly have at least three times more working energy in the die space than comparable conventional presses, while consuming 30 percent less electrical power. Showgoers also will want to stop by booth S513, where Komatsu will display its Twister fine-plasma cutting machine that cuts ¼-in. mild steel at 180 in./min., 1-in. steel at 45 in./min., and 5⁄8-in. aluminum at 60 in./min. Using the Quick Sliver process, Twister cuts ¾-in. stainless steel at 38 in./min. Its patented high-speed swirling assist gas ensures minimal dross and optimum cut quality.